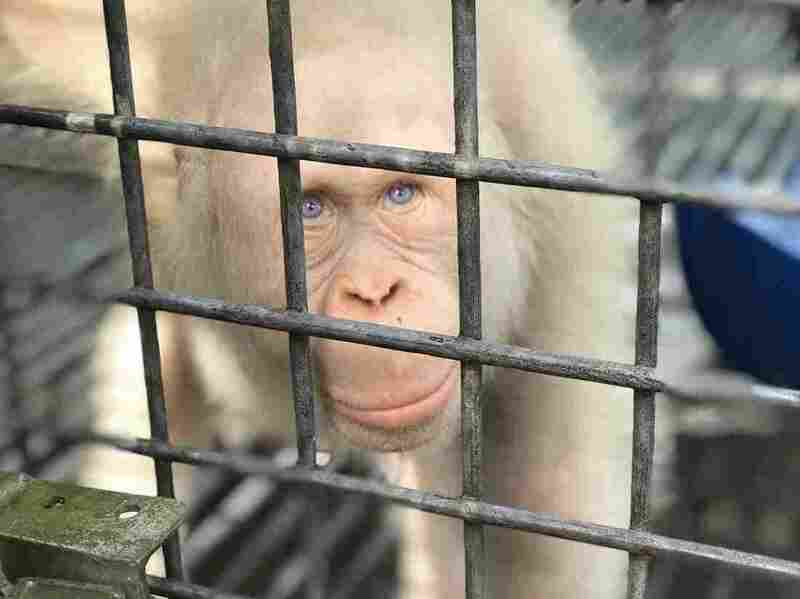 Alba The Albino Orangutan Is Now Free, Living In The Trees Again With striking blue eyes and white hair, Alba was rescued last year by the Borneo Orangutan Survival Foundation — which calls her "the only albino orangutan ever recorded." Alba, believed to be the world's only albino orangutan, was rehabilitated after she suffered a harsh captivity in Borneo. She's now been released and is living in the wild again. Alba, a rare albino orangutan who has captivated fans far beyond her native Borneo, is now free and living in a forest among other orangutans. She was released this week in a national park in Indonesia, along with Kika, a female orangutan with whom she had become friends. With striking blue eyes and white hair, Alba was rescued last year by the Borneo Orangutan Survival Foundation — which calls her "the only albino orangutan ever recorded." Alba was rescued in the spring of 2017 from a village on the Indonesian part of the island of Borneo, where she had been kept in a cage. At the time, she was an underweight 5-year-old suffering from stress, dehydration, a parasite infection and other ailments. She gained 10 pounds in her first 10 days under close care, the BOS Foundation said. The unique orangutan quickly became an Internet sensation after the foundation called for suggestions to name her in May 2017. They settled on Alba — meaning "white" in Latin and "dawn" in Spanish. Alba was released after researchers with the BOS Foundation and the local government's Natural Resources Conservation Agency weighed her prospects for thriving in the wild. Among other things, they worried that other orangutans might not accept her — a fear that now seems unfounded. "Alba has no inferiority complex as we imagined before. She is very confident compared to other orangutans," veterinarian Agus Fathoni told The Associated Press. "I think the real threat actually comes from humans. What we're worried about is poaching where this very special condition makes her a target," he added. As the great ape recuperated in captivity, Alba "formed a special bond with Kika," the foundation says. It describes Kika as a rescued orangutan who is a year older than Alba and who has "exhibited wild behaviors and a firm dislike for human presence from the very beginning." The pair were freed in Bukit Baka Bukit Raya National Park; within minutes, both of them had climbed aloft in the trees. Kika "burst out of her cage the second it was opened and reached for a small tree close by. She then swung to a larger one, and quickly climbed higher and higher," the foundation said in an update on Friday. Alba "slowly exited her cage and took in her new surroundings, moving cautiously," according to the foundation. "However, once she realized that humans were present, she quickly moved away into the forest and climbed up a tree." There, she "brachiated for a while, showing us her familiarity with a wild environment," the foundation said. In case you've forgotten, brachiating is the term for swinging from branch to branch by the arms. Since her release, Alba has stayed in the forest canopy, often at a height of at least 35 meters (115 feet). For the next six months, the foundation's staff will watch Alba in "nest-to-nest monitoring" that will cover her daytime activities. And while she was expected to cope well with returning to the forest among other orangutans, Alba's caregivers say her condition made her a special case. "The symptoms of albinism — namely the lack of the pigment, melanin, in her hair and skin — can lead to health complications, such as, poor eyesight, poor hearing, and skin cancer, and make her more vulnerable to hunting or predation," the foundation said earlier this year. Before the rescued orangutans could be released in the remote forest, they had to endure a journey that took around 16 hours. They were sedated and placed into green cages. The foundation's staff then transported them via trucks through muddy trails, followed by a four-hour boat ride. Workers slid pieces of fresh fruit through the bars to provide road snacks along the way. In June, officials had considered releasing Alba onto a forested island surrounded by man-made canals. But that plan was shelved in favor of returning her to an area that's more similar to her natural habitat. The orangutans' release was applauded by Gov. Sugianto Sabran of the Central Kalimantan province, where Alba has spent most of her life. He said the special orangutan is now an icon of his province. Both the Bornean orangutan and the Sumatran orangutan are deemed "critically endangered" by the International Union for Conservation of Nature. The BOS Foundation says it has released 114 orangutans into the wild in the same national forest where Alba and Kika now live.